Marcel-Valentin-Louis-Eugène-Georges Proust (July 10, 1871 – November 18, 1922) was a French intellectual, novelist, essayist and critic, best known as the author of In Search of Lost Time (À la recherche du temps perdu, also translated previously as Remembrance of Things Past), a monumental work of twentieth-century fiction consisting of over three thousand pages in seven volumes published over 14 years. Proust, along with James Joyce in Ireland, Thomas Mann in Germany, Robert Musil in Austria, and Italo Svevo in Italy is one of the seminal figures of Modernist literature. Proust was writing in a period of immense social upheaval in France. Around the time Proust was born, the Second Empire of Napoleon III collapsed and gave way to the beleaguered Third Republic, the first democratic government in France to survive any length of time. This new era in France's history was the context that generated an entirely new style of literature, as French intellectuals moved away from nineteenth-century social realism toward a sober examination of the workings of the mind. Growing urbanization, the submersion of the individual into the machinery of the industrial labor force, and new explorations of human psychology and the unconscious led to the birth of literary Modernism, a movement spawned by poets and writers, many of whom gathered in Paris. Of all the Modernists, Proust is perhaps the most quintessentially modern. Primarily concerned with the exploration of memory, Proust pioneered a "stream of consciousness" style of prose that followed incidental, usually trivial memories as a gateway into the processes of consciousness and identity. Proust's syntax is particularly demanding, but directly reflects his literary goals. As in unmonitored thought, a train of sequential associations is rendered through notoriously long sentences. Some stream of consciousness associations continue for 20 pages or more on the most ephemeral impressions—for example, a recollection of being sent to bed without a kiss. Proust maintained an unusually close—some would say neurotic—attachment to his mother and suffered poor health for most of his life. Early in his adult life the never-married writer carried on heterosexual affairs but he later frequented male brothels and was one of the first European novelists to treat homosexuality openly. He gradually withdrew from society and secured himself in a soundproof flat to devote to the solitary task of literary composition, often sleeping during the day and writing through the night. The son of affluent bourgeois parents, Proust was born in Auteuil (the southern sector of Paris's rustic sixteenth arrondissement) at the home of his mother's uncle, two months after the Treaty of Frankfurt formally ended the Franco-Prussian War. His birth took place during the violence that surrounded the suppression of the Paris Commune, and corresponds with the consolidation of the French Third Republic. Much of In Search of Lost Time concerns the vast changes, most particularly the decline of the aristocracy and the rise of the middle classes, that occurred in France during the Third Republic and the fin de siècle. Proust's father, Achille Adrien Proust, was a popular doctor and epidemiologist, well known for studying and attempting to remedy the causes and movements of cholera through Europe and Asia. He was the author of 20 books on topics in medicine and hygiene, as well as countless articles; serving as a model to Marcel. Jeanne Clémence Weil, Proust's mother and the daughter of a rich and cultured Jewish family, was highly literate and well read. Her letters demonstrate a well-developed sense of humor, and her command of English was sufficient for her to provide the necessary impetus to her son's later attempts to translate John Ruskin. By the age of nine Proust had suffered his first serious asthma attack, and thereafter considered himself a sickly child, as did his family and friends. Proust spent long holidays in the village of Illiers, which, together with aspects of his great-Uncle's house in Auteuil, became the model for the fictional town of "Combray," where some of the most important scenes of In Search of Lost Time take place (Illiers was renamed Illiers-Combray on the occasion of the Proust centenary celebrations). Despite his poor health, Proust served a year (1889-90) as an enlisted man in the French army, stationed at Coligny Caserne in Orléans, an experience that provided a lengthy episode in The Guermantes Way, volume three of his novel. As a young man Proust was a dilettante; a successful social climber, whose aspirations as a writer were hampered by his lack of application to work. His reputation from this period was that of a snob and an aesthete, which contributed to his later troubles getting Swann's Way, the first volume of his huge novel, published. Proust was quite close with his mother, despite her wishes that he apply himself to some sort of useful work. In order to appease his father, who insisted that he pursue a career, Proust obtained a volunteer position at the Bibliothèque Mazarine in the summer of 1896. After exerting considerable effort, he immediately obtained a sick leave which was to extend for several years until he was considered to have resigned. He never worked at this job, and he didn't move from his parents' apartment until after both were dead. His life and family circle changed considerably in the first five years of the twentieth century. In February of 1903, Proust's brother Robert married and left the family apartment. His father died in September of the same year. Finally, and most crushingly, Proust's beloved mother died in September of 1905. In addition to the grief that attended his mother's death, Proust's life changed due to a very large inheritance (in today's terms, a principal of about $6 million, with a monthly income of about $15,000). His health throughout this period continued to deteriorate. Proust spent the last three years of his life largely confined to his bedroom, sleeping during the day and working at night to complete his novel. 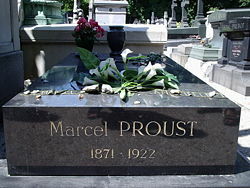 He died in 1922 and was buried in the Père Lachaise cemetery in Paris. Proust was involved in writing and publishing from an early age. While at school he published in the literary magazines La Revue vert and La Revue lilas. From 1890-1891 Proust published a regular society column in the journal Le Mensuel. In 1892 he was involved in founding a literary review called Le Banquet (also the French title of Plato's Symposium), and throughout the next several years Proust published small pieces regularly in this journal and in the prestigious La Revue Blanche. In 1896 Les Plaisirs et les Jours, a compendium of many of these early pieces, was published. The book included a foreword by Anatole France, drawings by Mme. Lemaire, and was so sumptuously produced that it cost twice the normal price for a book of its size. It received anemic reviews. That year Proust also began working on a novel that was eventually published in 1954 and titled Jean Santeuil by his posthumous editors. Many of the themes later developed in In Search of Lost Time find their first articulation in this unfinished work, including the enigma of memory and the necessity of reflection; several sections of In Search of Lost Time can be read in first draft in Jean Santeuil. The portrait of the parents in Jean Santeuil is quite harsh, in marked contrast to the adoration with which the parents are painted in Proust's masterpiece. Following the poor reception of Les Plaisirs et les Jours, and internal troubles with resolving the plot, Proust gradually abandoned Jean Santeuil in 1897 and stopped work on it entirely by 1899. Proust set out to translate two of Ruskin's works into French. However, Proust's plans to translate Ruskin were hampered by his lack of a firm command of English. In order to compensate for this his translations were a group affair: sketched out by his mother, the drafts were first revised by Proust, then by Marie Nordlinger, the English cousin of his lover Reynaldo Hahn, and then finally polished by Proust again. When confronted by an editor about his method, Proust responded, "I don't claim to know English; I claim to know Ruskin." The translation of The Bible of Amiens was published in 1904, with an extended introduction by Proust. Both the translation and the introduction were very well reviewed; Henri Bergson called Proust's introduction "…an important contribution to the psychology of Ruskin," and had similar praise for the translation. At the time of this publication, Proust was already at work translating Ruskin's Sesame and Lilies, which he completed in June 1905, just prior to his mother's death, and published in 1906. Literary historians and critics have ascertained that, apart from Ruskin, Proust's chief literary influences included Louis de Rouvroy duc de Saint-Simon, Michel de Montaigne, Marie-Henri Stendhal, Gustave Flaubert, George Eliot and Fyodor Dostoevsky. The year 1908 was an important one for Proust's development as a writer. During the first part of the year he wrote and published pastiches of other writers in various journals. These exercises in imitation allowed Proust to solidify his own style by exorcising the styles of writers he admired. In addition, in the spring and summer of that year Proust began work on several different fragments of writing that would later coalesce under the working title of Contre Saint-Beuve. Proust described what he was working on in a letter to a friend: "I have in progress: a study on the nobility, a Parisian novel, an essay on Charles Augustin Sainte-Beuve and Gustave Flaubert, an essay on women, and essay on pederasty (not easy to publish), a study on stained-glass windows, a study on tombstones, a study on the novel." From these disparate fragments Proust began to shape a novel on which he worked continuously during this period. The rough outline of the work was centered around a first-person narrator, unable to sleep, who during the night remembers incidents from childhood as he waits for his mother to come to him in the morning. The novel was to have ended with a critical examination of Sainte-Beuve, and a refutation of his theory that biography was the most important tool for understanding an artist's work. Present in the unfinished manuscript notebooks are many elements that correspond to parts of the Recherche, in particular, to the "Combray" and "Swann in Love" sections of Volume 1, and to the final section of Volume 7. Difficulty finding a publisher, as well as a gradually changing conception of his novel, led Proust to shift work to a substantially different project that still contained many of the same themes and elements. By 1910 he set to work on À la recherche du temps perdu. Begun in 1909 and finished just before his death, In Search of Lost Time consists of seven volumes spanning some 3,200 pages and teeming with more than two thousand individual characters. Graham Greene called Proust the "greatest novelist of the twentieth century," and Somerset Maugham called the novel the "greatest fiction to date." Proust died before he was able to complete his revision of the drafts and proofs of the last volumes, the last three of which were published posthumously and edited by his brother, Robert. It would be difficult to summarize the plot of Proust's masterwork due to its excessive length, but it would be a pointless endeavor since the action of the plot itself is secondary in importance to the narrator's memories and divagations in recounting his story. The main story is that of a Parisian dilettante, Marcel, who (much like Proust) spends most of his time idly socializing and fruitlessly searching for romantic love. The novel famously begins with the narrator dining on tea and madeleines. The aroma of the madeleines transports him back to his childhood, leading to a digression that will take several hundred pages to conclude. The novel continues on in this fashion, with the narrator recalling, in desultory fashion, all the major events in his listless life. Throughout the story the narrator occasionally interjects feelings of remorse for not having had a firmer direction in life; and by the end of the novel, he finally realizes that in writing his memories down—in writing the very book that the reader is reading—he has found himself and become what he never realized he was destined to become: a great writer. In this sense, the novel is a bildungsroman, or novel of development. We follow the development of Proust's narrator from his early childhood right up to maturity, and as we do we come to know him better than possibly any other character in literature. Important themes include alienation, the role of memory, and art. The novel shows how on the personal level we alienate ourselves from ourselves through distractions, but also, in memorable passages involving the telephone, automobile, and airplane, the dislocation wrought by the advent of new technology. Similarly, the author wove World War I into his story, including an aerial bombardment of Paris; the narrator's boyhood haunts have become a battlefield, with 600,000 Germans lost in the struggle for Méséglise, and Combray itself divided between the opposing armies. Proust propounds an implicit theory of psychology which privileges memory, the subconscious mind, and the formative experiences of childhood. Although he wrote contemporaneously with Sigmund Freud, neither author read a word of the other's work (Bragg). A contemporary influence may have been the French philosopher Henri Bergson, whose early work Proust had certainly read, and who in Matter and Memory (1906) made a distinction between two types of memory, the habit of memory as in learning a poem by heart, and spontaneous memory that stores up sense perceptions and impressions and reveals them in sudden flashes, like Marcel and his madeleines. The role of memory is central to the novel. Proust seems to say that what we are is our memories. Part of the process of distracting ourselves is distancing ourselves from our memories, as a defense mechanism to evade pain and unhappiness. When the narrator's grandmother dies, her death agony is depicted as her losing contact with her memory, as those memories seem to flow out of her. In the last volume, Time Regained, a flashback similar to the madeleines episode in the beginning of the novel initiates the resolution of the story—Proust's trademark, a profound sensory experience of memory, triggered especially by smells, but also by sights, sounds, or touch, which transports the narrator back to an earlier time in his life. A large part of the novel—as with much modern art—serves as a reflection on the nature of art. Proust sets forth a theory of art, democratic in appearance, in which we all are capable of producing art, if by art we mean taking the experiences of life and performing work upon them, transforming them artistically, in a way that shows understanding and maturity. 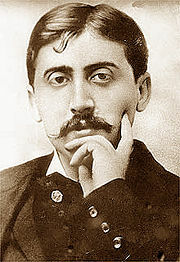 Proust's work is revolutionary, and does not fit very easily into the literary traditions that preceded it; although Proust was an admirer of the great French realist novelists, Henri-Marie Stendhal and Gustave Flaubert in particular, his novel is not by any means a conventional realist novel. While much of the literary traditions before Proust were interested in presenting an "objective" view of their characters' psyches, Proust's narrator is inextricably connected with our reading of the events he presents. One could even argue that the entirety of In Search of Lost Time takes place inside the narrator's head. This shift of focus towards an entirely modern "stream of consciousness" technique was revolutionary, and Proust, perhaps more than any other novelist writing in Europe, was a master of the technique. In 1995 Penguin undertook a fresh translation of In Search of Lost Time by editor Christopher Prendergast and seven translators in three countries, based on the latest and most authoritative French text. Its six volumes were published in Britain under the Allen Lane imprint in 2002. The first four (those which under American copyright law are in the public domain) have since been published in the U.S. under the Viking imprint and in paperback under the Penguin Classics imprint. 1904 - La Bible D'Amiens; a translation of John Ruskin's The Bible of Amiens. 1906 - Sésame et les lys; a translation of John Ruskin's Sesame and Lilies. This page was last modified on 13 August 2018, at 16:18.